The developer work on Diablo III Patch 2.1 is nearing the end, as the patch comes closer to release. Diablo community representative Brandy "Nevalistis" Camel will host a special developer interview to talk about the new patch, on next Thursday, August 21st at 11:00 a.m. PDT. 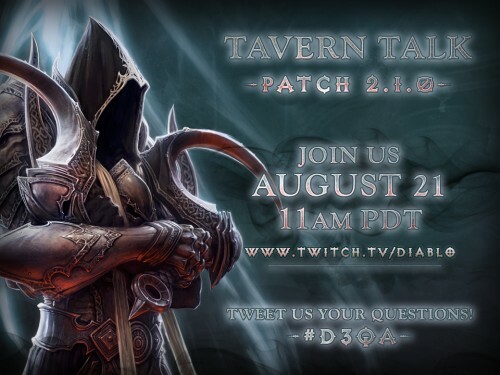 The 'Tavern Talk' discussion will three of the Diablo III game designers, and should be very informative. Here are all the details! We're making preparations to launch our first major content patch for Reaper of Souls. To give you an inside look at this massive update, we're inviting you to join us live on Twitch! We hope you've been having a blast testing your hearts out on the 2.1.0 PTR. Your feedback and bug reports have been invaluable as we've tweaked, cut, added, and polished this latest update, and we want to take some time to share our thoughts with you on all the new features headed your way. So, on Thursday, August 21st at 11:00 a.m. PDT, we'll be making ourselves comfortable in the Blizzard Studio to hang out, chat, and answer some of your questions about the patch and its development. Who can you expect to see on stream? Following some casual round-table discussion on new systems and content being introduced in patch 2.1.0, we'll host a short Q&A with our developer guests. Is there something you're dying to know about the patch? Then be sure to ping @Diablo using #D3QA right now or leave your questions in the comments! Won't be able to make it? No need to panic—we'll be uploading the VOD shortly after the stream to our Twitch and YouTube channels so you can re-watch at your leisure. Can't wait to see you there! Because of this special event, the Play Your Way livestream has been pushed back. There is an ongoing poll for that community event right now as well, so you can vote on which of the recent featured builds you like the best! With all these events going on, we will be hearing a lot from the Diablo III developers over the near future.